Filament Server System by JuliaTruchsess is licensed under the Creative Commons - Attribution - Share Alike license. which I believe to be vastly superior. Ever since my filament collection got past 3 or 4 spools I've been searching for the holy grail that would allow me to change filaments quickly without handling spools. It didn't take too long to figure out that if random access is a requirement, a separate holder for each spool is needed. That narrows the field pretty much to two approaches: holders on which a spool sits, bearing on its edges, and holders that involve an axle through a spool's hub. The former, in order to yield acceptably low friction, require ball or roller bearings. Since I wanted to accommodate 40+ spools, this approach was ruled out as too complex and time-consuming. I wanted something consisting of a few simple printed parts and a press-fit assembly process that would allow me to bang out 40+ holders in a few days. The TInkertoy-like result is presented here. Every single filament end is within arms' reach and I can change filaments without touching a spool. Only 7 different printed parts are necessary to cover most spool sizes on the market, at least the ones I use. These include 200x70mm (MakerBot, Prototype Supply), 160x90mm (Octave), 200x55mm (pp3dp, Bendlay), 220x55 (3dprintingsystems.com), Taulman, and others. A really nice aspect of the system is that you can have multiple rows of spools, one behind the other, to maximize storage in a given shelf space. Simply feed the rear spools' filament under the front spool(s) and through its guide loop. One of the attached videos shows a rear spool in action. Use of rubber feet, especially on rear-row spools, is strongly recommended, to prevent them from creeping forward and touching spools in front. Another great side benefit is that I've now removed the spool holders and spools previously attached to the printers, liberating at least a square foot of precious bench space. 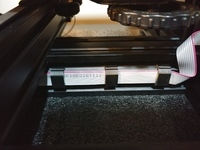 The "funnel" attached to a gantry directly above the printer(s) is not strictly necessary, but it's convenient, keeps filament from dangling in front of my monitor, keeps all the filament ends in one place, and reduces the sideways force vector on the printer when its feeding spool is located some distance off to the side. The foam in the funnel cleans the filament, and more importantly, helps tame the unruly mass of protruding filament ends. Since it won't be easy to change the foam with 40 filaments going through it, you might want to have a separate, easily-changeable cleaner foam located at each printer. Full construction details are in the Instructions section. All printed parts are available on Tinkercad, search for "FSS". You will need some 1/4" diameter oak dowels (don't use pine, use oak), and some 1" and 1-1/2" black "poly" pipe (shown in the photos), available at home improvement stores. Regular PVC pipe's wall thickness is too big, and will NOT fit in many spool hubs. You can also use thin-wall styrene tubing sold by plastics supply companies. For Taulman spools you need to find something smaller; I happened to have some styrene tubing around that fit, but you could use copper pipe. The accompanying Excel document lists the axle diameters, axle lengths, and support dowel lengths for the various spool sizes supported. You don't need to saw the dowels - simply measure them off, making score marks with a pair of diagonal cutters, as shown in the photos. Once scored you can snap them off with your fingers or cut them with a pair of compound-leverage lineman's pliers. Don't worry about the getting the lengths exactly right, and don't bother to sand the ends clean. It's all very forgiving of a few mm here or there. The axle tubing is best cut with a power mitre ("chop") saw. If you use a hand saw I recommend a mitre box, otherwise the ends will not be square and the axles will be prone to falling out of the bearings. The press-fit of the dowels into the printed parts is nice and snug, but easily done by hand (at least with parts printed on my Up). The front-back braces for the large-spool holders are optional, and I find them unnecessary if stick-on rubber feet are used; the oak dowels are very stiff and splay is minimal. Without rubber feet they might be more necessary. There is also provision for "pinning" the front-back supports with small sheet metal screws if you want the ultimate in rigidity and stability. Just drive them into the dowels with your screwdriver.